One Net approach like EFF announced some time ago for the purpose of protecting its free and open character. The campaign of EFF underlined the need to raise awareness about the value of the Net as a public resource. The evolutionary aspect coupled with the aim to identify the evolution layers that keep developing, extending or modifying previous constructs. Macroscopic view of the Net (like the style of R.Khare in Seventh Heaven, like the Pseudo-area idea of F.Baker from IAB/IETF in order to monitor layer-2 developments from IETF (organized into Areas) but not getting into the actual domain of work since other organizations like the IEEE are directly concerned). French Scientist Joel De Rosnay has a whole book devoted to this approach for complex systems. In chapter 4 of his book he considers information and interaction. Central issue is the stages of development (like L.Robert's timeline but for a shorter period) this is the zoom level we work at. He starts from Gutemberg's press and closes with ARPANET. He identifies as intermediate stages the following advances: Photography, Radio transmission, the Telephone network, Televison and the Computer. Key concept the Quantum of Automation that is embodied onto the Net (like Baran's idea to automate his command-and-control scheme with US radio stations) with each advance taking place. The first quantum that I located was that of DNS. Marshall Rose once said "in the time honoured tradition of the hosts.txt ...." validating my discovery. Prior to DNS, the Net operated under manual naming procedures, later I discovered L.Roberts refering to the automation of the telekom network. Examine the whole of technical advances and see the outcome, was a legitimate proposition put forward by J.Postel according to R.Khare. Eric Levenez created a picture concerning UNIX, connecting all versions and associated advances over the years. This is very close to the aim of Internet Systematics. Since there is no overall plan about the Net, Internet Systematics offers an holistic interpretation conditioned by the actual advances emerging. This is the main idea, to extract a "model" from the sequence of advances, C.Papadimitriou from Stanford chose Game Theory to model aspects of the Net stating that the Net offers a paradigm beyond Von Neumann, validating somehow my initial problem statement, namely " to see what the Net looks like", in the early 80s. The concepts of "metacomputing" and "metasystem transition" of Valentin Turchin provided the guiding principles applied to the distributed computing arena and community rather than the field of Software construction. Here is the source of the idea to combine machinery and users as one entity also. Turchin calls it a "meta-mechanical" process so the blog has the name "meta-artificial" implying a next stage from that of artificial intelligence the era where computing emerged) . A RAND study is also using the term "noosphere in relation to WWW and evolution so it comes close to Turchin also. 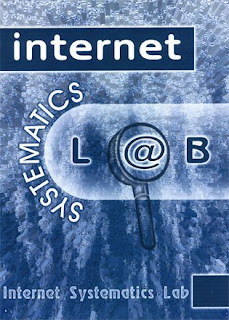 in simple terms, the global Net and its binding Community is a phenomenon unfolding a novel entity that Internet Systematics seeks to provide semantics for. Papadimitriou was awarded the 2012 Goedel prize for the work you mention. Your turn now!